Below is the 2018 season recap for the Green Bay Packers. 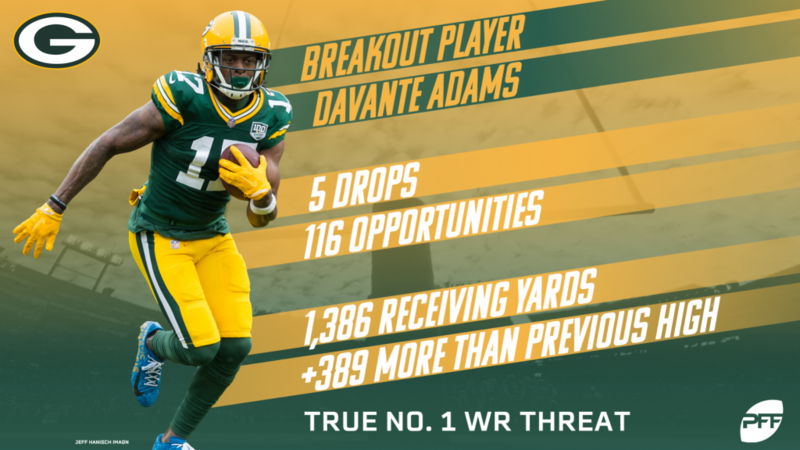 Davante Adams emerged as a true No. 1 threat. He gained the most yards of any receiver in the NFL with a step or more of separation. 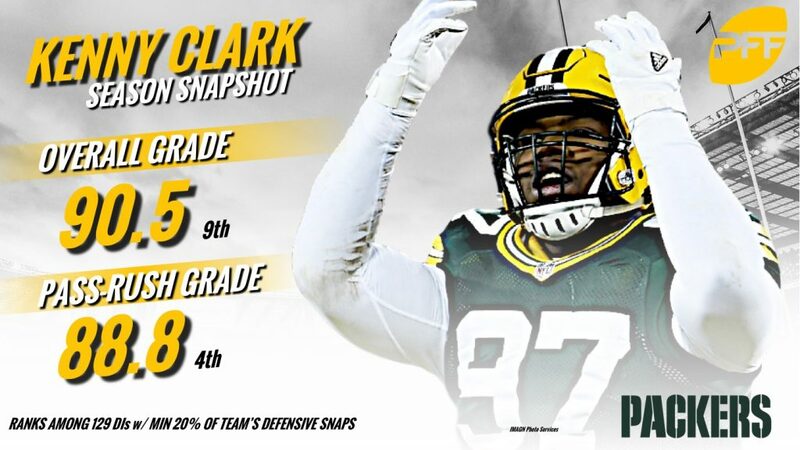 Kenny Clark once again proved to be unstoppable, but added even more this year in terms of pass-rush, racking up 46 pressures on his 408 pass plays. 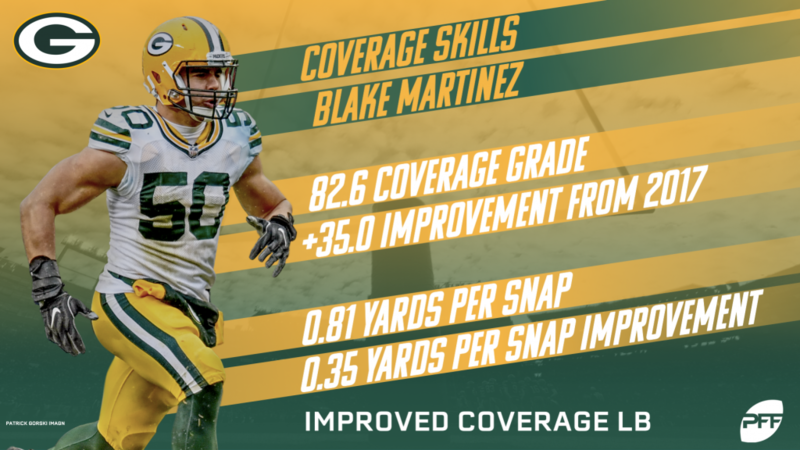 Blake Martinez carried the team’s linebacking corps and finished the team’s best coverage grade. 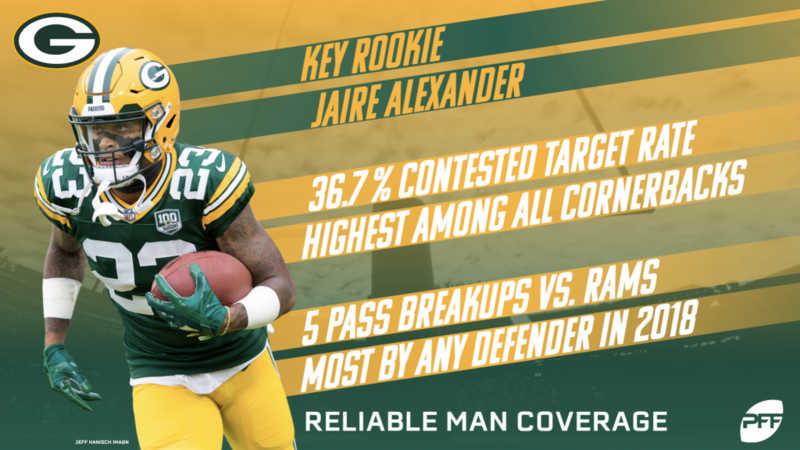 Jaire Alexander hit the ground running as he contested targets at a higher percentage than any other CB in the league. No one really established themselves as the number two wide receiver as Geronimo Allison got hurt and the rookies Equanimous St. Brown and Marquez Valdez-Scantling were inconsistent. No edge defender had more than 30 QB pressures, and it took Clay Matthews 376 pass-rush snaps to obtain that mark of 30. Kentrell Brice was an issue at safety as he missed 12 of his 57 total tackle attempts on the season and allowed a passer rating of 150.1 on 29 throws into his primary coverage. The offense once again came and went with Rodgers. When he targeted receivers things went well, but he took a ton of sacks and set the PFF single-season record for throwaways. Clark established himself as arguably the league’s best nose tackle. He finished with a run defense grade of 90.2 and pass-rush grade of 88.8. 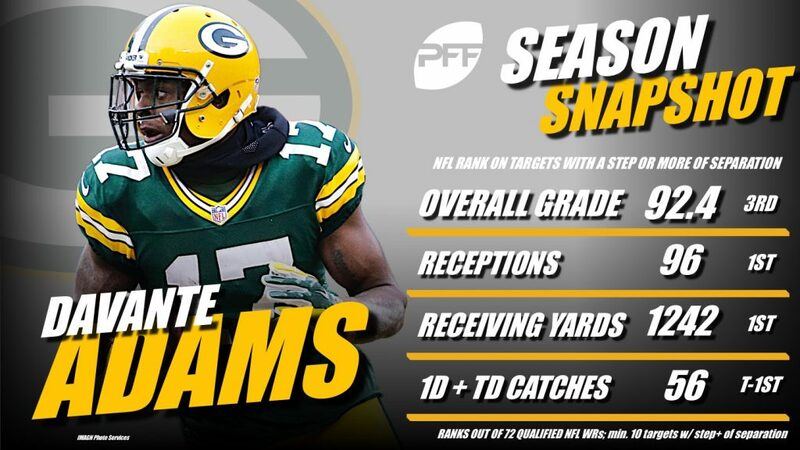 Davante Adams’ 1,386 yards were 389 more than his previous career high. He also had his most reliable season catching the ball with only five drops on 116 opportunities. 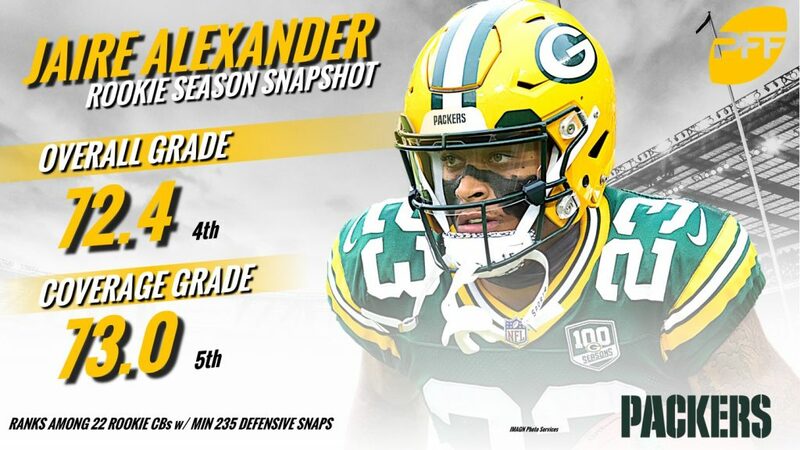 Alexander was one of the league’s highest graded corners in man coverage this season. His five pass-breakup performance against the Rams was one of the best games all season. 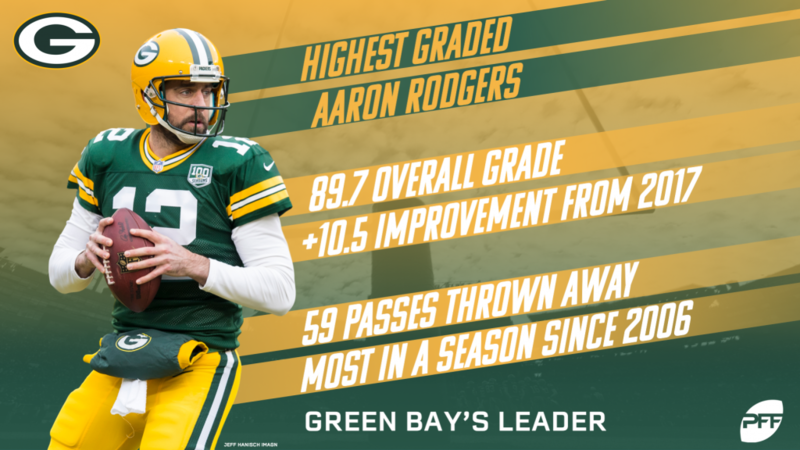 The ability is obviously still there for Aaron Rodgers, but it was abundantly clear that they needed a change from an offense that had grown stale.